I'm Here. I'm Queer. What the Hell do I read? : Best Friend Next Door - two ten-year-old girls (one with two moms) become neighbors, and maybe they'll become friends, too. 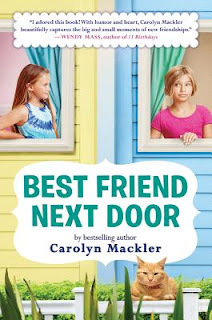 Best Friend Next Door - two ten-year-old girls (one with two moms) become neighbors, and maybe they'll become friends, too. Meet Hannah. Her name is a palindrome. Her birthday is on New Year's. She wishes she had a cat. She's medium height and a little awkward. Her life has NOT been fun lately -- her dad and stepmom are having a baby and, worst of all, her best friend next door just moved away. Now a new girl is here, taking over her best friend's bedroom . . . and her own identity. Meet Emme. Her name is a palindrome. Her birthday is on New Year's. She loves her enormous orange cat. She's so short that last week she was mistaken for a kindergartner. She's found moving hard . . . but at least there's the girl next door, Hannah. Maybe they ll become friends? While Hannah and Emme are alike in so many ways, they're also different in some wrong ways, too. Is this the perfect friendship . . . or a recipe for disaster? What's queer about it? Emme has two moms. Add your review of "Best Friend Next Door" in comments!